​​ DALLAS-FORT WORTH - Commercial construction starts have risen by 27 percent in the first half of the year, compared with the same period in 2015. And the DFW area ranked in the top ten markets in the country for commercial and apartment building, according to a new report by Dodge Data & Analytics. Starts of more than $2.8 billion in North Texas commercial projects were recorded for the ranking. Dodge Data tracks project including office buildings, stores, hotels, warehouses, garages and service stations and multifamily housing. Nationwide, commercial and apartment building starts dropped 5 percent during the first half of the year from 2015 levels. One of the biggest declines was in Houston, where building starts plunged 44 percent. 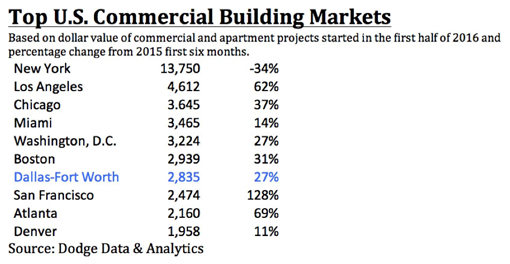 DFW ranked seventh nationally for the total value of commercial building starts. The New York City area leads the country with almost $14 billion in new building in the first half 2016. ​See Dallas-Fort Worth Market Overview Market Research.